How does my hearing work? Why choose Florida Medical Hearing Centers? Hearing begins with the creation of sound. All sounds generate vibrations that travel through the air to your ear. The external ear funnels these sound waves through the ear canal. The shape of the ear canal enhances these sound waves before they reach the eardrum. At the eardrum sounds are converted into vibrations that are detected by a group of tiny bones (malleus, incus and stapes) that comprise the middle ear. 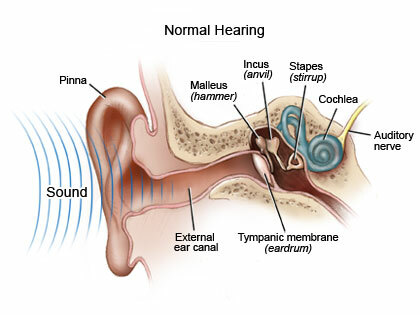 The vibrations are conducted through the tiny bones in the middle ear to the vestibular window which separates the middle ear from the inner ear. The brain stem then receives these signals and sends them to the auditory cortex of the brain which interprets the electrical impulses into the sounds we hear.The cochlea (inner ear) has three chambers each processing different frequencies of sound from vibrations into electrical impulses that are transferred to the cochlear and vestibular nerves.